Should I run the system in a ungrounded (floating) setup or keep it negative grounded? I know if the change is made from a negative grounded to a ungrounded system I would need to change the DC disconnect for bolth current carring conductors vs one. Any help would be great on this, thanks. Last edited by goodoleme; 07-11-2018, 12:12 PM. Owner says never less than 50% DOD. Should I buy these? Is this a good value? If not, what is? 8 used batteries for almost $200 each. Seems like a waste of money to me. Purchasing used batteries is not a good idea. Paying that much for each is a crime. Back to the OP question and ignoring the hyjacker. OK not sure how or what the system is installed in like a home, camper, RV etc not much to be gained to Float the System, only cost more money. In fact even though the CC may offer you the option to bond either polarity or float does not mean any of the other equipment and panels allow you to do that. Example the Inverter most likely has the battery Negative polarity bonded to Chassis internally you cannot change which makes it a Grounded System by default. Failure to bond the Battery Term Post to ground can result in defeating your Over Current Protection Devices (OCPD) like breakers or fuses. If in an RV or Home wiring system, you are still required to bond equipment chassis to Ground be it dirt or vehicle frame, and no real gain Floating the battery, just added expense. Potable and Emergency systems can benefit from Floating, but that is another topic. The system is installed in a home in NA. The negative ground bond can be made in the Inverter (XW+ 6848), PDP, and the CC (60/150, 80/600). The CC is configured for the negative ground bound as of now. When the CC is setup for the negative ground bound, does it provide better GFP than if the Inverter or the PDP was making the same bond? SK,When the CC is setup for the negative ground bound, does it provide better GFP than if the Inverter or the PDP was making the same bond? OK you are talking Apples and Oranges, translated DC circuit protection vs AC circuit protection. Those are two different systems. If you bond the battery Negative Term Post to Ground (Making it a Grounded System) , then you would set the Controller to Neg-Chassis bond. If you Float the Battery, then you Float the CC and Bond the CC Chassis Ground Term Post to Ground. Code allows you to Float the Battery if under 50 volts nominal, but regardless if Floated or Not, you are still required to bond all metallic parts to ground. That takes care of the DC side of the Inverter and apples. On the AC side of the Inverter we have Oranges and separate grounding requirements where we make the Neutral to Ground Bond. You are still required to bond the chassis to Ground. No one else can do this for you, perhaps a schematic would help you? Take Note AC Neutral Bond likely does not apply to you because it is done for you inside the Inverter. The Inverter like the Controller may have an option to Bond Neutral to Ground either inside the Inverter (not shown) or Outside the Inverter as shown which makes the AC Ground Orange side of the house. Last edited by Sunking; 08-20-2018, 09:39 PM. Thanks for the info, not sure if I asked the question I had right, sorry. 1. The Inverter, not going to do it here when I have the pdp. 3. Power Distribution Panel (PDP) ? As of now I have the Neg-Chassis bond made in the CC. Should I keep it here or make the bond in the PDP? PV array EGC is connected to the CC. PDP ground comes from the main panel with 2 phase conductors and a grounded phase conductor (neutral). Inverter load sub-panel has the ground and 2 phase conductors and a grounded phase conductor from the PDP. My Main panel is where the AC Neutral Bond is made, not in the Inverter or the PDP, you cant make the AC Neutral Bond from within the Inverter, only within the PDP for off grid use. The XW+ does not switch or disconnect the AC neutral in any mode of operation, so even in invert (back-up) mode, the inverter load sub-panel neutral is bonded to ground by the main panel. Also in both of your schematics, the pv array EGC is connected directly to the GE. I wanted to make this same connection also as I don't want to invite any unwanted electricity into the CC/system. Last edited by goodoleme; 08-24-2018, 12:30 PM. One place and 1 place only, the battery negative term post. I have a question about grounding vs. floating for my upcoming project. I am planning to install a simple 12v system to a small off-grid cabin with metal roof in the PNW. Will use for led lights, dc fan, dc fridge, and possibly a vacuum or other small appliance (with inverter less than 1000W). My preference is to have a floating system, and wonder if and how I could design it so it is safe? Can I simply install fuse blocks* on the + and - ends of the total battery system? What would the recommended XXXa rating be if so? P.S. I am new to group and are only able to post reply at the moment - so I found a relative thread to post my question; my apologies for any inconvenience. 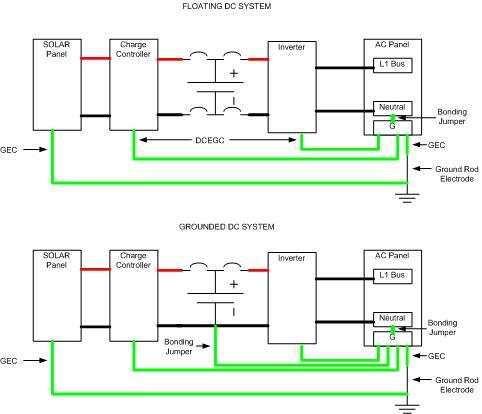 Grounding/ground and a grounded/floating system are not the same. Last edited by goodoleme; 08-21-2018, 10:07 PM. SunKing et. al.,: First post. Been following for a long time. Many thanks. Not a solar guy. I'm avionics. But, y'all provided me with a great education. I can't see the photos from the ground tutorial link referenced above that you provided sometime back. Would really like to see them. Not a solar guy. I'm avionics. Could you confirm the difference between Grounding/ground and a grounded/floating? My guess from the first link is that an RV would be a grounded/floating, while a house would be a Grounding/ground. - ie to install a system the same size (or smaller) than RV systems, yet on a shed not on rubber wheels. --> As per the post, a 400w inverter it'll be. How can I ground for this project so it is safe? *The one missing link of info is that I wasn't able to see the pictures in the first link. What type of inverter are you going to use? A mobile inverter cannot (well should not) be used in a dwelling, in any code compliant manner, does not have UL1741 and is internally bonded N-G.
A mobile inverter, when used right, is only used with plug and cord (receptacles), is not connected to a GES and for the most part has a negative ground bond on the DC side of the battery. A dwelling inverter is UL1741 and does not have receptacles, they have hardwire terminals approved and listed for residential wiring. They come with battery chargers to charge batteries from AC power and or a generator. Needs a GES, need a bonded N-G, (IN ONE PLACE! and one place only). And need a grounded system on the DC side, battery and the PV. I would read the: https://www.solarpaneltalk.com/forum...round-tutorial again, again and again. Also read up on NEC article 250, 760, and 690.